Organisations typically use several different methods to assess job applicants: you will usually be asked to complete an application forms, send in a copy of your resume and attend at least one interview. All of these things will tell the employer something about you and help them to choose the most appropriate candidate for each vacancy. One method that is becoming increasingly used is job aptitude tests. These tests aim to providing a potential employer with an insight into how well you work with other people, how well you handle stress, and whether you will be able to cope with the intellectual demands of the job. Job aptitude tests can be split into personality tests and aptitude/ability tests. Personality has a significant role to play in deciding whether you have the enthusiasm and motivation that the employer is looking for and whether you going to fit in to the organization, in terms of your personality, attitude and general work style? As an indicator of your personality and preferences, these tests can help prospective employers to find the best match of individual to occupation and working environment. As a recruitment and selection tool, they can be applied in a straightforward way at the early stages of selection to screen-out candidates who are likely to be unsuitable for the job or, using a more sophisticated approach, to provide guidance on career progression to existing employees. Aptitude and ability tests on the other hand, are designed to assess your intellectual performance. They consist of multiple choice questions and are administered under exam conditions. They are strictly timed and a typical test might allow 30 minutes for 30 or so questions. Your test result will be compared to that of a control group so that judgments can be made about your abilities. These types of test can be broadly classified onto the groups shown and you may be asked to sit a test which consists only of ‘numerical’ questions or these may form part of a test which consists of questions of different types. This will depend very much on the job you are applying for. 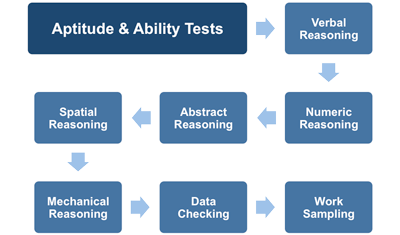 For example, jobs that require you to handle figures on a day to day basis may have a higher proportion of numerical reasoning questions, whereas tests used for information technology jobs tend to have a higher proportion of abstract reasoning questions. These questions which test your ability to spell words correctly, use correct grammar, understand analogies and follow detailed written instructions. These tests are widely used since most jobs require you either to understand and make decisions based on verbal or written information or to pass this type of information to others. These include questions on basic arithmetic, number sequences and simple mathematics. These tests are directly applicable to many administrative and clerical jobs but can also appear as a component of graduate and managerial tests. Sometimes information is provided that requires you to interpret it and then apply the appropriate logic to answer the questions which may approximate the type of reasoning required in the workplace. These questions are based on diagrams and measure your ability to identify the underlying logic of a pattern. Abstract reasoning questions are thought to give the best indication of your general intelligence and because they are independent of language they are ‘culture fair’. These tests are of particular value when the job involves dealing with abstract ideas or concepts as many technical jobs do. However, as they also provide the best measure of your general intellectual ability, they are very widely used and you will usually find some questions of this type whichever particular tests you are given. These questions measure your ability to manipulate shapes in two dimensions or to visualize three-dimensional objects presented as two-dimensional pictures. Spatial ability is required in production, technical and design jobs where plans and drawings are used, for example; engineering, architecture, surveying and design. However, it is also important in some branches of science where the ability to envisage the interactions of 3 dimensional components is essential. These questions are designed to assess your knowledge of physical and mechanical principles. They are usually in the form of a question and a diagram and you will need to determine which mechanical principle is being illustrated. No specialist knowledge is required to answer these questions, only an understanding of mechanical principles. Mechanical reasoning tests are used to select for a wide range of apprentice and engineering occupations. These questions present you with number of tables of information which must be checked against each other. This type of test is used to measure how quickly and accurately errors can be detected in data. It is used to select candidates for clerical and data input jobs, particularly where accuracy is important, for example, accounting and banking. In these tests you will usually be given two columns of data to check for consistency and you will be asked to mark up any differences.